The final lap. Those final few seconds of recklessness, where the few drivers who’ve managed to keep their cars together keep the gas pedal down and try daring moves to bid for every position. When it’s a battle for the lead, these seconds become the stuff of legends. Donnie Allison and Cale Yarborough locking bumpers at Daytona. Dale Jarrett’s photo finish with Davey Allison at Michigan. Kurt Busch and Ricky Craven bumping and sliding around Darlington. It can be argued, in fact, that the best races are remembered most by what happens after the white flag drops. Consider, if you will, all the moments we’d have lost if the caution froze the field on the final lap. What if Doug Heveron’s crash on the apron of Turn 1 denied us the photo finish between Richard Petty and Cale Yarborough in 1984? Or if Lake Speed and John Andretti’s spin forever made us wonder if Dale Earnhardt really could hold off Bobby Labonte that final half-lap of the 1998 Daytona 500? Sure, those races really did end under caution. Sure, the lead didn’t change either time. Sure, Petty’s 200th and Earnhardt’s Daytona 500 win were landmarks in their own right. But on those days, the drivers knew that the caution flag meant something very different. The broadcasters’ voices kicked up a notch, because they knew it too. It meant that lap now constituted the white, and that who reached the finish line first would still determine the winner. Do you remember the thrills of Talladega in the spring of 2004? Or at Daytona, in July 2008? No? That seems hard to believe. In 2004, with four laps to go, Jeff Gordon and Dale Earnhardt, Jr. were side-by-side in Turns 3 and 4, two of the most popular drivers set for a legendary photo-finish in a physical race. In 2008 on a green-white-checkered, Carl Edwards and Kyle Busch were side-by-side, too, looking to settle who was the driver of the year, the one who would truly challenge Jimmie Johnson’s title reign. But both of those finishes, like that on Sunday, were denied to us. Denied because a wreck that happened well behind them froze the field with acres of clear track in front of them. And so their stories are lost, just as Sunday’s debacle will be forgotten by all but infamy. The current rules cite safety, saying that crews need a chance to get to the cars quicker, as if the wreck will just magically stop at the moment of caution and as if the leaders don’t have spotters alerting them to slow down once they reach the finish. These feigned concerns only mask the inconsistency of NASCAR’s enforcement. 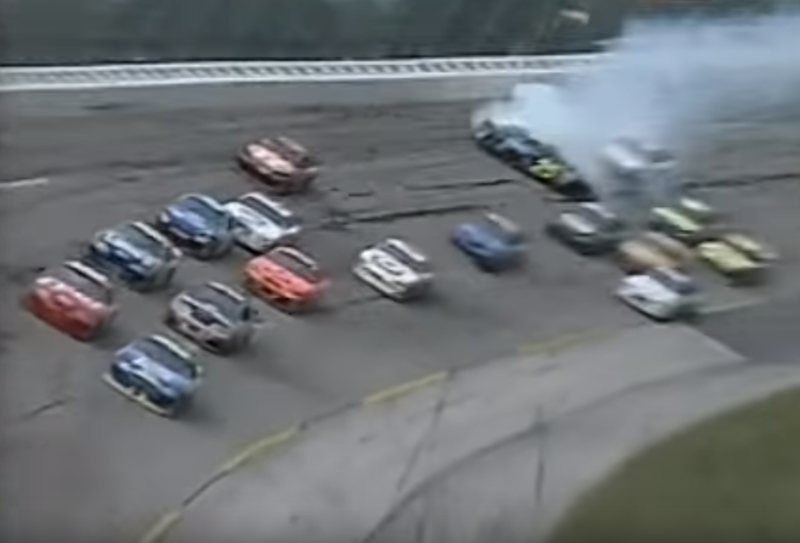 On the final lap at Talladega in the fall of 2005, Dale Jarrett was leading when Kyle Petty spun by himself into the inside wall on the backstretch. In the last corner of Talladega in 2006, Jimmie Johnson and Dale Earnhardt, Jr.’s wreck was also on the apron as Brian Vickers looked to hold off Kasey Kahne for the lead. And just this year at the Daytona 500, Kyle Larson and Jeff Gordon spun to the inside while Joey Logano steamed safely into Turn 3. While each of these three wrecks were well clear of the remaining cars on the track, all three races ended under caution. 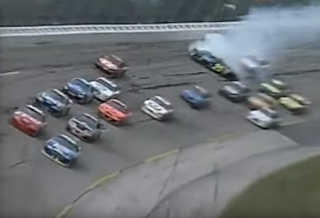 Still, when 20-car pileups came at the end of Talladega in the fall of 2001 and again in 2012, the race still ended under green. This inconsistency based on a fallacy of safety cannot stand any longer. The final lap, the final push to the finish line - whether with one to go or heading to the final caution - is sacred. It’s what every driver dreams of, earning a win as they cross the stripe. And it’s what every fan in the stands pays for, hopes for, waits for through hours of strategy and daring to witness. Some fans watch racing for the personalities, others for the crashes, but all of them want to see a green-flag finish. They expect it, and they should. They should because racing isn’t like football, isn’t like baseball, isn’t like some ordinary game where one team can build an insurmountable point lead, making the final moments a formality. It’s a race. In the final stages, a legend like David Pearson can lose an engine, or two champions like Dale Earnhardt and Darrell Waltrip can tangle, opening doors for first-time winners like Terry Labonte and Kyle Petty, who did under those very circumstances in 1980 and 1986. I, for one, am sick of being robbed of those final few seconds - especially when the series heads to its most precarious and most intimidating tracks at Daytona and Talladega. I’m sick of believing the hype, of remembering a time where the finish line meant something and wasn’t some wandering point on the track arbitrarily moved by a late-race altercation. I’m sick of being disappointed by a lackluster ending to an entertaining race, sick of being derided for saying I wasn’t entertained when, in reality, racing is both sport and entertainment. When it fails to enthuse, it fails as entertainment, just like a bad movie. But unlike a movie, what plagues NASCAR isn’t a poor script but a misguided effort to control the one thing that shouldn’t. The solution is simple. Make it a rule on the last lap, anything goes - no exceptions. When a caution flies on the last lap, or within a pre-determined number of laps short of the finish that is announced in each drivers meeting, let the leaders race to the caution flag. Let them do whatever they want - race below the yellow line while you’re at it. You can still freeze the field under prior cautions, freeze it after the leaders reach the stripe and end it under caution, but at bare minimum let the fans have their moment beforehand. The moment they paid for. And best of all, you don’t even need a single red flag or green-white-checkers to accomplish this. If this rule is in place, and the drivers know about this beforehand, know also that the rule won’t be changed on the fly during the event, there will be no confusion from both drivers and fans. There will be, crash or no crash, a race to the finish line - whether on Lap 198 or Lap 200. With this rule in place in April 2004, we would have seen the photo-finish between Gordon and Junior. In July 2008, we would have known if Kyle really would have defeated Carl. And on Sunday, during the first yellow for what NASCAR deemed a “false start,” we would have seen if Logano really could have held off Junior for 2.66 miles. Who knows? Maybe they would have rivaled Daytona 1979, Michigan 1991, or Darlington 2003. It’s time we stop coddling our drivers and insulting their skill. And it’s time the sport start clearing away pointless and contradicting rules in place of practical procedures that are the core of racing. To NASCAR, I say this. You say these are the best stock car drivers and teams in the country? Fine, then trust them to pick their way through whatever separates them from the moment of caution to the finish line. You say these cars and tracks are safer than before? Fine, then show more trust in what you’ve created that they and their drivers can survive to make it that final mile. You say you should be the number one motorsport in the country, that you have the most passionate fans and best racing? Fine, then don’t deny those fans their final sprint to the finish line. I totally agree with you. It is about the last lap that feelimg, that excitement, is why we are all here. NASCAR wants their fans back this is one way to get them back or do it how they do in ARCA never finish under caution. I agree. This needs to change.